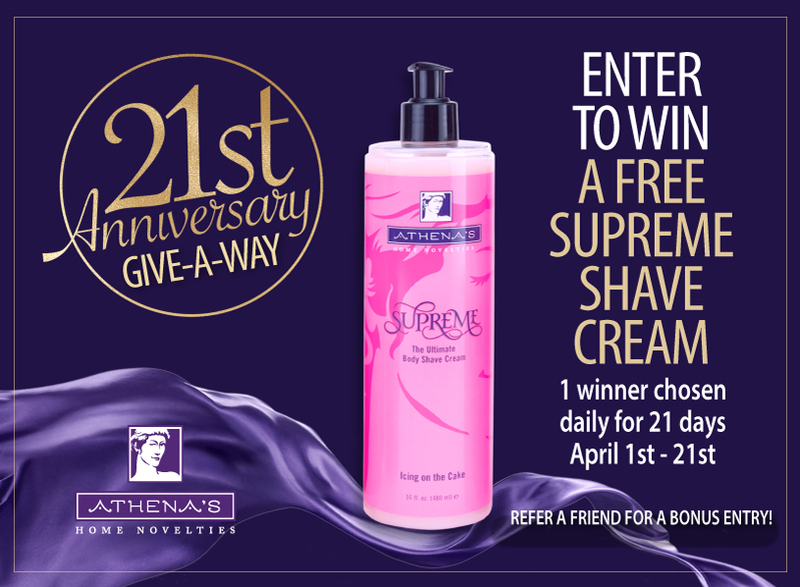 Enter to win an Athena's Supreme Shave Cream! The fun never stops. Enter for a chance to win a Supreme Shave Cream "Icing On The Cake" scent. We are awarding 21 prizes with our best selling Supreme Shave Cream, in celebration of our great customers. Share this offer and get a bonus entry. We'll pick one winner a day for 21 days starting April 1st. You can enter once a day and share often for bonus entries. Good Luck! Complete the form to enter. We will notify the daily winner by e-mail. Your Name. First and Last. This promotion is managed by Athena's Home Novelties. Participation in this promotion is subject to the official rules.